Of course, I’m aware that Dr. Chaps might be pulling my leg. Maybe he’s making me jump through all of these hoops because he doesn’t think I’ll actually do it. Well, today I started doing it, beginning my journey towards exorcism. Even if he doesn’t live up to his end of the bargain, I’m sure I can find someone to exorcise me. Today I watched the first half-hour segment of his training series, taking notes and filming my reactions to his sermon. I don’t recommend watching it unless you’re really interested in what he has to say, but here is the video link. In the video he teaches how to “discern spirits,” both good spirits (the Holy Spirit and angels) and bad spirits (demons), as well as the human spirit. He says something that made me chuckle about how to tell the difference between good and bad spirits: What are the voices inside your head telling you to do? In other words, give into whatever mental illness you have and try to make rational choices regarding morality. I should also add that I thought religious people believed morality was biblically objective, but that’s neither here nor there. Anyway, I’m not going to dwell on his sermon. I’ll critique the entire thing when I’ve seen all 17 episodes (quite possibly in a Youtube video). I’ve shared this idea with a lot of people, and there seems to be some kind of ball rolling. Several people want to help me make a documentary of my journey to exorcism, the exorcism itself, and my response to the exorcism. Therefore, this post reflects my first step in this project. I’m not sure how many parts this blog series will have, but it should be rather lengthy. 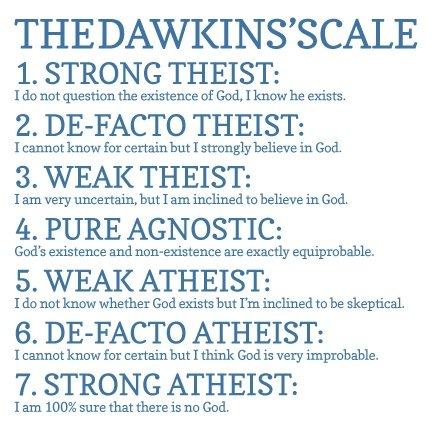 I’ll end each one by using Richard Dawkins’ theism/atheism scale and position myself somewhere on it. Before watching Klingenschmitt’s video I was somewhere between a 6 and a 6.5. My position has not changed, even after watching his video. And I don’t expect it to. This entry was posted in Atheism and tagged Atheism, atheist, Christianity, Christians, Exorcism, God, Gordon Klingenschmitt, Jesus, Religion, the bible. Bookmark the permalink. Lol – I honestly can’t wait to hear how this continues! Wow, you have a lot more patience than I do. Good luck to you. 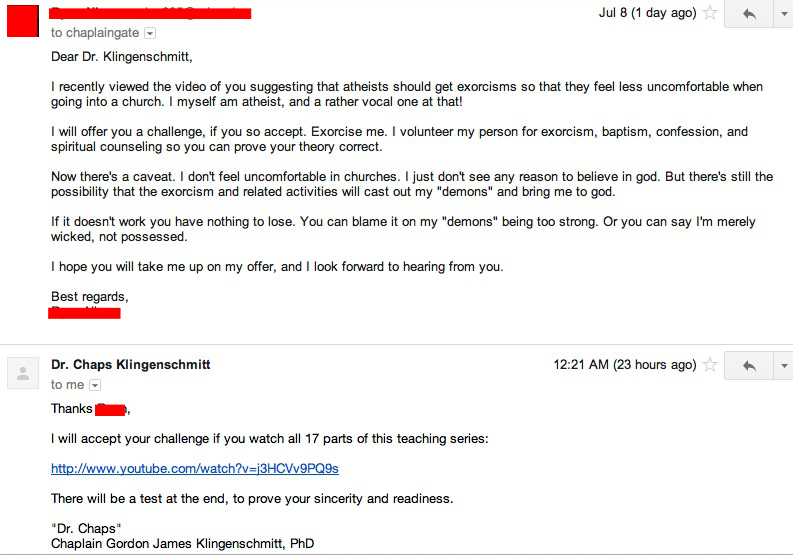 Gotta say it will be HILARIOUS if after getting exorcised you do decide you’re not an atheist anymore. “Hilarious” might not be the right word. That would qualify as ironic — I go into a long, drawn-out project with the expectation of making a point, only to find myself convinced of the opposite. That’s irony. But I wouldn’t count on it. I’ve been atheist my entire life precisely because I find spiritual claims to be meritless, without evidence. I doubt I’ll find evidence after watching a bunch of Youtube videos, critiquing them, and then being spritzed by water while some guy chants in Latin.